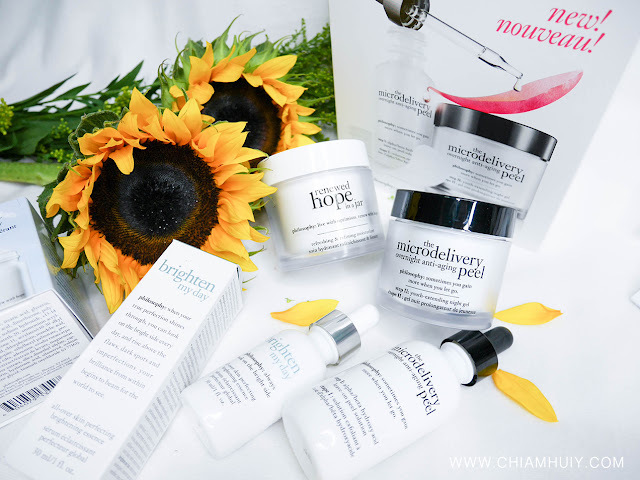 I always have high expectations from Philosophy skincare brand because of its slogan: believe in miracles. Also partly because most of their formulas are created by doctors and scientists, I have absolutely strong faith in their products to treat different skin issues and problems. Today's post will delve more into their recommended three-steps skincare regime, namely Cleanse, Peel and finally Treat. Let's see how it fairs! 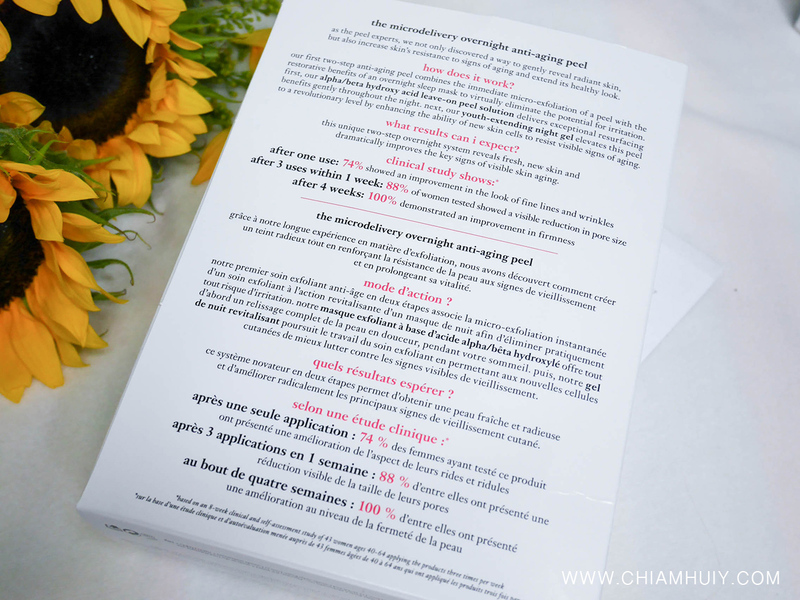 The first step involves cleansing using Philosophy Purity facial cleanser. I tried using Philosophy Purity facial cleanser to remove all the make up and found the result to be promising. The red residue was from by gel lipstick, which is to be fair really hard to remove if without proper makeup remover. I reckon Philosophy Purity facial cleanser is mainly to double cleanse the face after removing all the make up. Philosophy Purity facial cleanser does a good job in cleansing my skin. My skin feels really clean and refreshed after using it as my daily cleanser in the evening, since it promises multi-tasking formula that cleanses, tones, dissolves away makeup and lightly hydrates in one easy step. 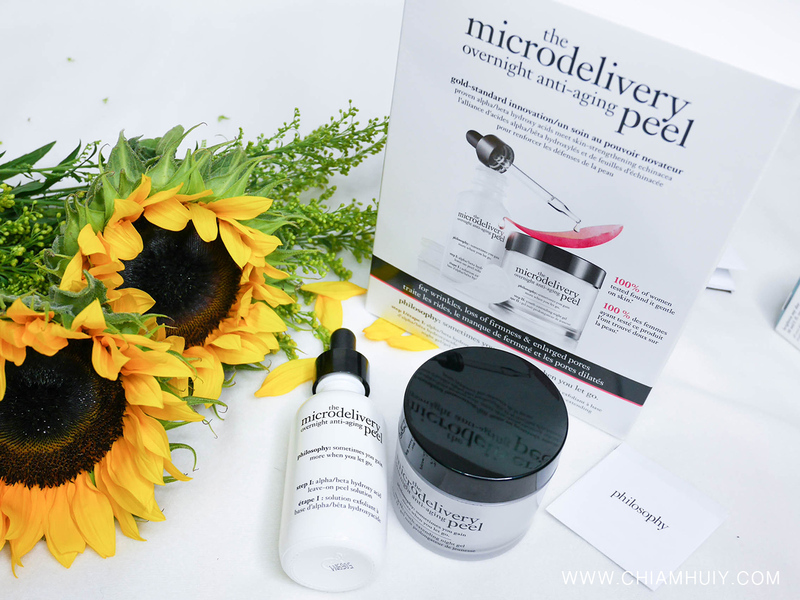 Moving on will be Philosophy’s latest addition - the Microdelivery Anti-aging Peel skincare package. 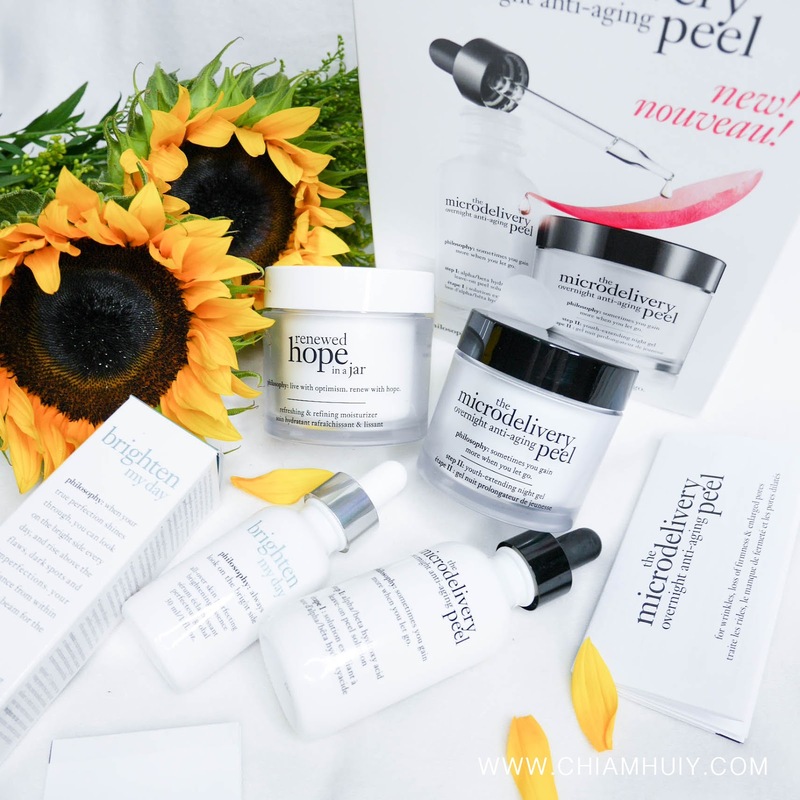 Start off with the alpha/beta hydroxy acid leave-on peel solution. Just like the name suggests, it's a solution that exfoliates mildly overnight to deliver resurfacing benefits. It's also recommended to use with the cotton pads that are provided in this pack. There was a slightly tingling sensation when I first applied this across my skin using the cotton pad. The sensation goes off after a while. Then, to make sure that your skin don't dry out, apply the youth-extending night gel. It will help to moisturise your face although gentle exfoliation is taking place overnight. This night gel feels quite light weight and it doesn't feel very greasy on the skin. It gets absorbed pretty well after a while. Review: some parts of my skin actually started to peel the next day after my first use. Only areas around my nose and upper lips showed signs of peeling, but the whole face was rather dry. I would advise applying a lot of moisturizer, perhaps a stronger one, so that you skin really doesn't dry out. 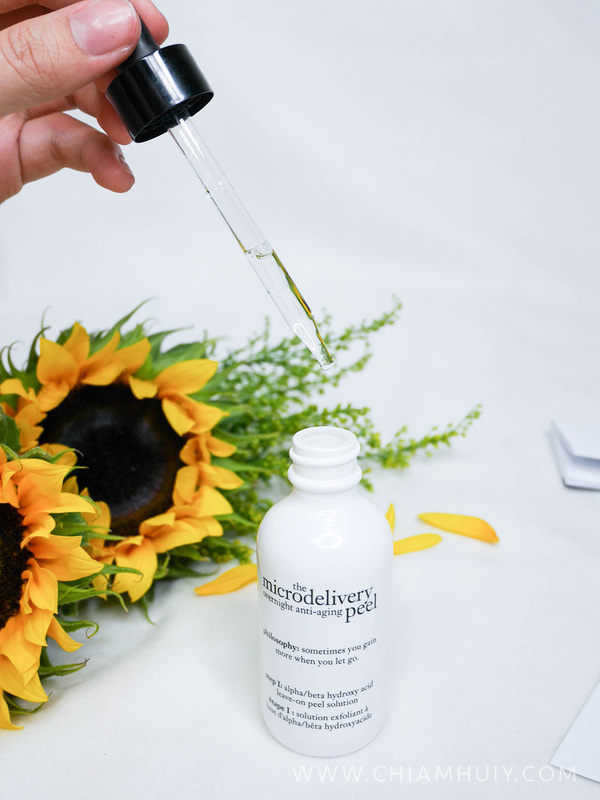 Microdelivery Anti-aging Peel skincare package. 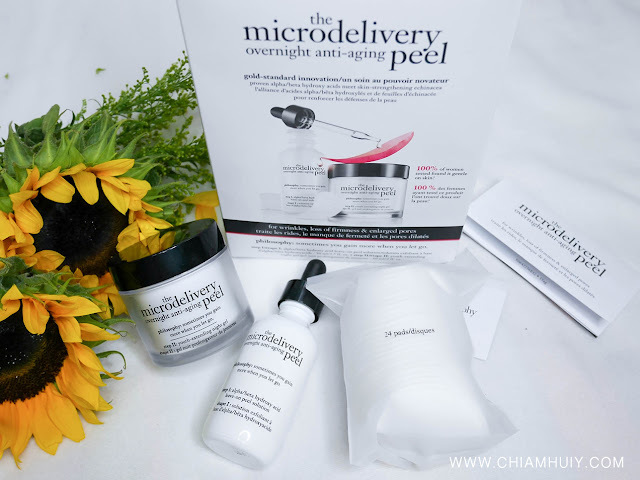 The Microdelivery Anti-aging Peel is a newly developed two-step anti-aging peel that combines micro-exfoliation of a peel with restorative benefits of an overnight mask. 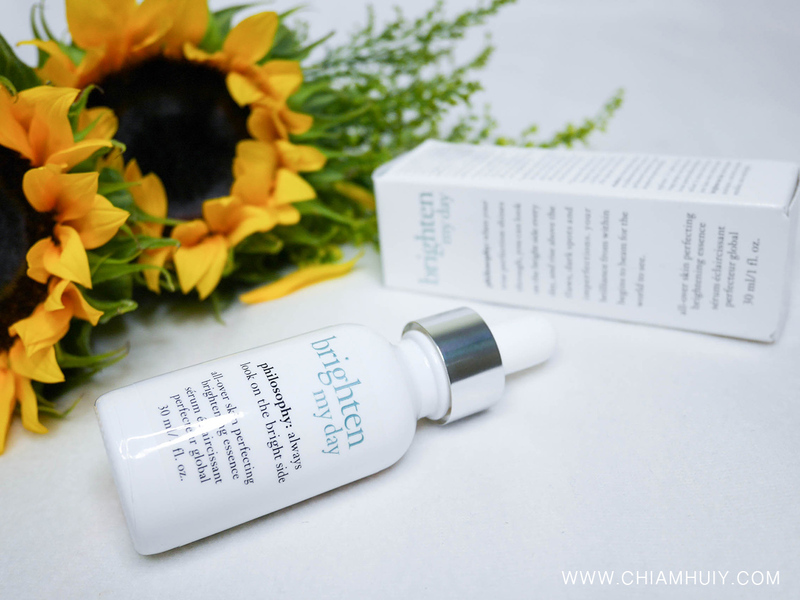 Together, this can help reduce presence of wrinkles and improve skins firmness and texture. 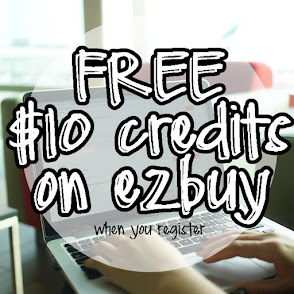 In fact, 100% of surveyed women demonstrated an improvement in skin firmness after 4weeks of usage. The recommended usage of this Microdelivery Anti-aging Peel is 2-3 times a week. Finally after exfoliation, it's time to treat and maintain. 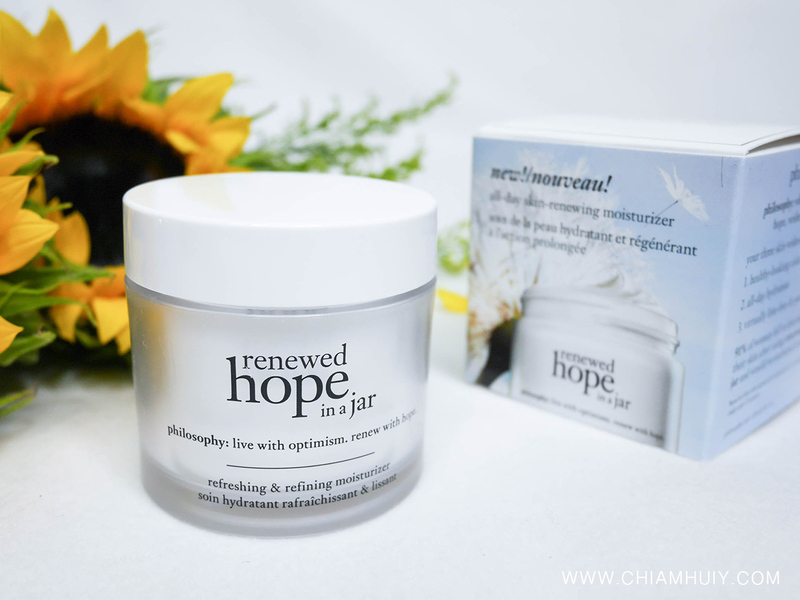 Move on to Renewed hope in a jar moisture cream for added moisture. For daily usage, I also tried the Brighten my day all-over skin perfecting brightening essence. 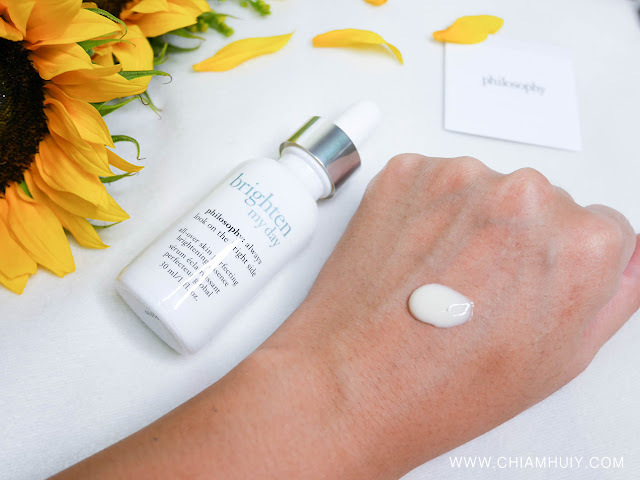 Despite being in an ampoule form, the Brighten my day all-over skin perfecting brightening essence is a cream-based serum which is pretty nourishing and rich. 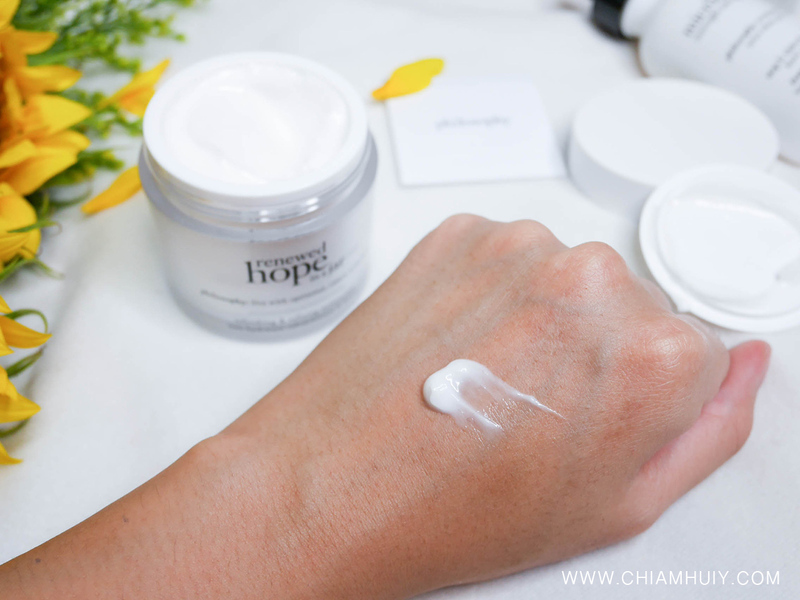 I tried on both the Brighten my day all-over skin perfecting brightening essence and Renewed hope in a jar moisture cream for a few days. Unfortunately, I have to report less than pleasant result because my skin had breakouts after using these two products all together. I am guessing the products are too rich for my skin, since I have never used any cream-based serum along with yet another cream-based moisturiser. 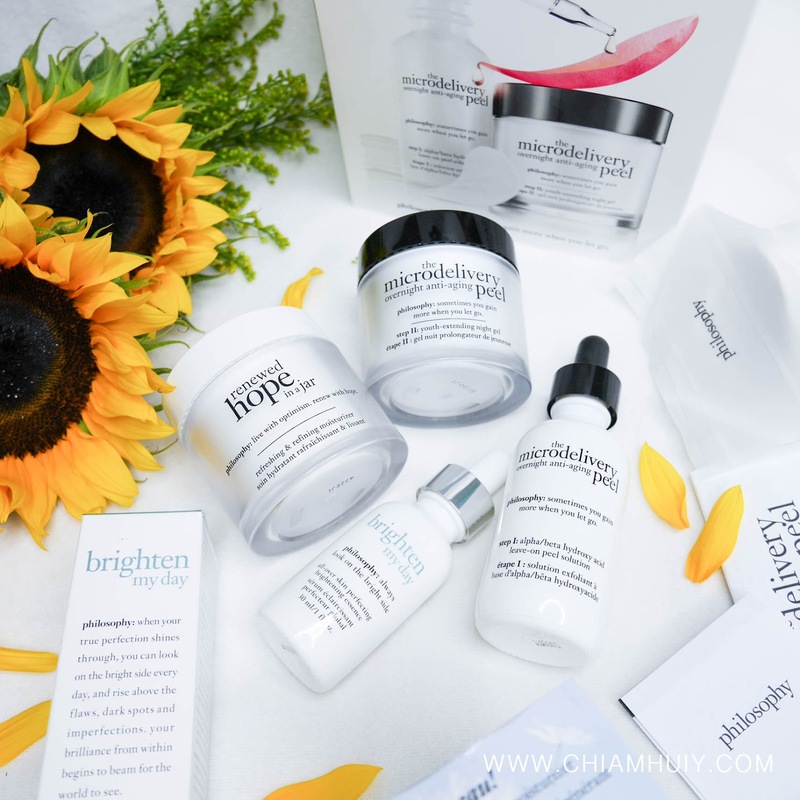 I wanted to be fair for this so I asked my good friend Alene, who is also a beauty blogger, about what she thinks about this range. She didn't face any breakouts so I am thinking it's just solely my skin sensitivity issues. All in all, I strongly recommend readers to know what kind of products suit them most before blindly buying them. For those with really sensitive skin and are prone to breakouts like me, you may still try these items, but perhaps apply a thinner than usual thickness of the moisturizer. I am actually having a giveaway right now on my instagram! Feel free to hop over to join in the giveaway :) 5 winners will be winning a set of a purity cleanser (240ml) AND RHIAJ moisturiser! Good luck! !